One would have thought that the Zionist Anglo-American war cabal would learn from their failures in propaganda warfare, especially now when their credibility is at rock bottom. Post 9-11 and the Iraq wars, people the world over have got wiser to the devious propaganda ploys orchestrated by the global mass media. Pointing an accusing finger within an hour of a false flag operation no longer carries any weight even if it is repeated hour on the hour by CNN, FOX, BBC etc. without an iota of evidence. Obama and Hillary Clinton, war criminals and mass murderers, for all the bravado and rhetoric, sound hollow and come across as devious and opportunistic. In trying to lay blame at Russia and the Donesk opposition forces that are fighting against the Kiev coup leaders installed by the Neocons, the propaganda stooges of the mainstream media have tripped themselves by making the most elementary mistakes. The Daily Mail (UK) carried a report by Australian journalist, Demjin Doroschenko that there was looting at the site of the crash. He drew the conclusion purely on the fact that, he had found not one wallet that contained money while he was going through some of the passengers’ belongings to retrieve personal information on Australian victims. In one brief statement, this pseudo journalist hopes to malign the resistance forces who have been battling the illegitimate Kiev regime installed by the Neocons and are now guarding the crash site. In any country when a person unlawfully enters a crime scene, he would have been indicted. Doroschenko would like us to believe that he is not a looter but was merely retrieving personal information. He has also alleged that the site was not properly secured. But, he took upon himself to play the role of an investigator. He has no business to enter the site and to retrieve any information. He went specifically for the wallets. If his intent was genuine and sincere, he would look for passports. We also know that intelligence operators often posed as journalist. Journalists have no right and or authority of any kind to enter a crime scene and examine evidence related to the crime. Was any journalist allowed to enter ground zero immediately following the collapse of the Twin Towers on 9-11? Was any journalist allowed to enter the Pentagon crash site and rummage through the wreckage to retrieve information on 9-11? Then we have Michael Bociurkiw, an alleged observer from the OSCE who said, it basically looks like the biggest crime scene in the world right now, guarded by a bunch of guys in uniform with heavy firepower who are quite inhospitable. Why is this propaganda stooge complaining that the site was being guarded by armed personnel? On the one hand, Doroschenko complains that the site was not guarded, but here we have an OSCE “observer” stating categorically that the site was guarded by heavily armed guards but, because he was not allowed into the crime scene, he vented his frustrations by making derogatory remarks about the guards. Putting tapes around a crime scene is S.O.P. and the purpose is to prevent any unlawful intrusion. And the crime scene is spread over a wide area – a few sq. kilometres. Security personnel are still combing the area for debris from the crash. It is therefore impossible to effectively secure the crash site entirely when it is spread over a few sq. kilometres! He is but an “observer” and he should just observe but he has no authority whatsoever to enter the site as an investigator. Only duly qualified investigators are allowed. Let us examine his words again, especially “looks like the biggest crime scene in the world right now.” What is the motive underlying such a statement? It is to divert attention from the war crimes committed by Zionist Israel in the biggest crime scene at the moment – GAZA where mass murder is taking place against innocent men, women and children. The headlines of the Zionist-controlled mainstream media must now focus on MH 17 and away from Gaza so that Israel may continue their wanton massacres. 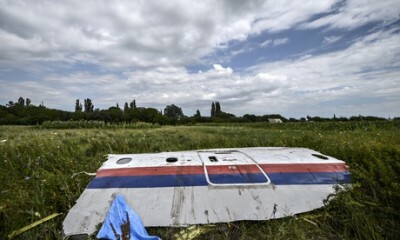 But, this is not to say that the deliberate murder of the crew and passengers of MH 17 is not a heinous crime. It is! But, this false flag operation was committed to achieve bigger agendas, one of which is to divert attention from the heroic resistance by the Palestinians against Israel. In my many articles on false flag operations, I have asserted categorically that it is the S.O.P. of Israel to piggy back on someone else’s false flag operations so as to deny any responsibility. It is no coincidence that the shooting down of Malaysia’s MH 17 coincided with the ground invasion of Gaza. Israel knows too well the intentions of the war party who have suffered setbacks after setbacks in trying to bait Russia to invade Ukraine thereby justifying a counter attack by the US and NATO forces. Sanctions to isolate Russia did not work and in fact have boomeranged! The latest round of sanctions proposed by US was not supported by the EU. This led to the unilateral sanctions by Obama. A false flag operation was therefore needed to influence public opinion with a view to isolate and demonizing Russia, thereby setting the stage for a UN-declared sanctions regime against Russia coupled with further war provocations. The global mass media was already primed to launch the propaganda campaign. Hillary Clinton was only too willing to beat the drums of war to strengthen her image as a “strong leader” committed to a war agenda to maintain the Zionist Anglo-American hegemony. The day before the downing of MH 17, the Kiev regime deployed the Buk surface-to-air missiles to Eastern Ukraine for that said purpose. Such a deployment would make sense and deemed reasonable if the Opposition forces had aircrafts. They don’t even have tanks and or sophisticated military hardware. Their weapons were taken from Ukraine’s military bases. Why did Ukrainian air traffic controllers allow the plane to deviate from the regular route to the north, towards “the anti-terrorist operation zone”? Why was airspace over the warzone not closed for civilian flights, especially since the area was not entirely covered by radar navigation systems? We need also to ask the Kiev regime, why target Malaysia’s MH 17? Let me suggest an answer. To follow the template of MH 370 investigations! To be precise, to have another country take control of the investigation as Australia has done in the case of MH 370 as the alleged crash site was “near” Australia. It would be impossible for Malaysia to be in control as the search for MH 370 had to be directed from Perth. Already, there are suggestions that a European country should head the investigation even though the plane is a Malaysian registered plane. There will be another cover-up so that there will be no evidence linking the mass murder of the crew and passengers of MH 17 to their Western perpetrators. Obama and the war party have made a fatal mistake. In assuming that they have total control of the global mass media, Obama and the war party immediately initiated a global propaganda war against Russia regardless of the evidence. It is unfortunate for the war party’s plans that the plane crashed into an area controlled by the Resistance forces which makes it that much more difficult to plant evidence as Doroschenko and others had attempted. We have not forgotten that the US Navy shot down an Iranian civilian jet and mass murdered all the passengers. No apology was proffered by the US war criminals to Iran. They are now condoning the mass massacre of Palestinians in Gaza by Israel. Yet, these war criminals have the audacity to point a finger at Russia and the resistance forces against the illegitimate Kiev regime. Russia is not Malaysia and has more resources at its disposal. It is a military power. It is a matter of time when the truth about who fired the missile at MH 17 and from where will be established. I am confident that when the truth is out, Obama, Hillary Clinton and the war party will be exposed as serial liars. And not only would the US suffer a humiliating propaganda defeat, it would also have disastrous financial and economic consequences – the world would turn their backs on the US, the dollar and hasten the final phase of the global financial tsunami – the End Game. I am disappointed with the Malaysian mass media which have uncritically reproduced the propaganda spun by the Zionist-controlled global mass media. There was no attempt to present a balanced view as to the events leading to the downing of MH 17. No views were sought from Russia. Why are Malaysian mass media quoting uncritically reports from US, UK and Australia but none from RT, and other Russian mass media? Why highlight Obama’s finger pointing when there was no evidence to support his allegations? Why is the Kiev regime exempted from responsibility? The airspace is under the control of the illegitimate Kiev regime. The emergency personnel at the site are from the Kiev regime and as such to allege uncritically that the Ukrainian Resistance was obstructing is without basis. What is so wrong to put the bodies in refrigerated coaches to preserve the bodies for identification? There are enough pictures showing even the observers from OSCE wearing face mask to shield them from the bodies. Yet, when some bodies have not been removed to the refrigerated coaches (as not all bodies could be removed at once), the Western press levy criticisms that such bodies have been left to rot! Yet, this standard operating procedure of preserving bodies under difficult circumstances have been ridiculed and criticised as an attempt to remove evidence. Where is the objectivity? It is about time that we in Malaysia do not fall prey to Western propaganda. On the issue of the black box – should it not be kept safe and secure rather than being left at the site pending the arrival of Malaysia’s delegation? When Malaysia exercised the right of ownership to the MH 370 black box, if and when it is recovered, there were third countries challenging that right. Malaysia had to send a delegation to the UK to verify this inalienable right! Malaysia should not let emotions get the better of sound judgment and not make hasty accusations. Malaysia was severely criticised for MH 370. Russia and its leaders are being blamed for something for which they are not responsible. Yet, having suffered such one-sided criticism for MH 370, one would have thought that we Malaysians should be more circumspect in pointing fingers at Russia and its leaders. Stop this nonsense and wait for full investigations! Shame on you Malaysian mass media! Why are you in cahoots with the Obama regime in spewing nonsense? If the truth shows that the fascist Kiev regime was responsible for downing MH 17, is Malaysia willing to apologise to Russia for the false accusations? Will our mass media pay compensation to the leaders of Russia for the defamatory articles they carried? Malaysian mass media should not be the mouthpiece of Western propaganda!